Jesus' prayer on behalf of his followers is "that all may be one. As you, Father, are in me and I am in you, may they also be one in us" (John 17:21). 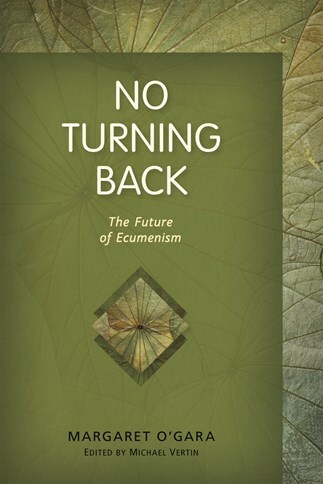 No Turning Back illustrates significant developments in ecumenism during the thirty-plus years of ecumenical theologian Margaret O'Gara's own engagement in ecumenical dialogue. An invaluable resource for academic and ecclesial specialists in ecumenism, teachers and students of theology and religious studies, Christian ministers, and all educated Christian adults who take seriously Jesus' prayer "that all may be one." Margaret O'Gara was born in Chicago in 1947. She completed undergraduate studies at Trinity College, Washington, DC; master's studies at Yale Divinity School; and doctoral studies at the University of St. Michael's College, Toronto. For thirty-six years she was a member of the faculty of theology at St. Michael's. During that time she also served on six different ecumenical dialogues. She died in 2012 after suffering from cancer for two years. Intended for both general readers and ecclesial or scholarly specialists, the collection manifests the breadth and depth of Margaret O'Gara's ecumenical engagement. It reflects the attentive and probing scholarship I came to expect from her as a colleague and dialogue partner: scholarship that opens up possibilities for fresh insights and understanding, but without sacrificing her identity and convictions as a Roman Catholic theologian. Perhaps what endeared Margaret most to Mennonites was her love of hymn singing—a practice we cherish. Thus it is of more than passing interest to us that she chose a song phrase as the title of her work. Singing with her, we met on solid ground and found the grace to persist in difficult and strenuous conversations—no turning back. No Turning Back shows Margaret O'Gara's great command of the ecumenical literature, especially in ecclesiology. Her essays are well organized and thorough. She is honest, insightful, even-handed, occasionally provocative, and always lucid. This fine book will bring the new participant in ecumenical dialogue up to date on page after page. Embodying decades of profound theological scholarship, it will augment the wisdom of the veteran. And its committed inclusiveness reflects the Lord whose crucified arms embrace everyone and whose dereliction finds no one God-forsaken. "This is a work of love. Much of O'Gara's work was done in response to specific topics that arose in the many ecumenical dialogues in which she played a leading role. It is a great service to bring them together. This volume continues and amplifies the mutual gift these of her first volume." "No Turning Back invites the next generation of ecumenists to both personal transformation and intellectual rigor. It has a strong potential as an anchor text for advanced courses developing both the spiritual and intellectual practices of ecumenical dialogue." The first part will be especially valuable for students of ecumenism looking for guidance. The essays and addresses in the second part provide profound insight into how Margaret understood her calling to serve the church in the work of Christian unity from within her Catholic home. No Turning Back provides a picture of Margaret O'Gara, a model ecumenist, at her best. Taken collectively, the essays offer astute theological insights into ecumenical perspectives, especially perspectives on authority, in addition to practical suggestions for the ecumenical endeavor, notably the essentially collaborative nature of theological study and dialogue. . . . No Turning Back is beneficial for all theology students, Christian readers, and ecumenical specialists. It provides all readers with a clear and thorough sense of the ecumenical work that has been done, and it encourages its movement forward by offering a glimpse of a life dedicated to such work. These essays, across the breadth of the theological and ecclesial landscape, will readily speak to interested beginners in ecumenism as well as those deeply immersed in ecumenical dialogue and its theological challenges. May they ignite a passion for ecumenism in a new generation of theologians and ecclesial leaders! This book will serve to keep alive Margaret O'Gara's deep commitments to an ecumenism that is grounded in theological integrity, honest dialogue, abiding prayer, and (most significantly) personal friendships. "At the very least No Turning Back gives non-Catholics a much better understanding of Catholic doctrinal positions as well as challenges, from the perspective of a life-long Catholic and theologian, and at the very best it inspires Christians, leaders, pastors and communicators of all denominations to continue to work towards unity, understanding, and an ability to agree to disagree without hostility, suspicion and contention." Margaret O'Gara, with a profound commitment to Christian unity, recognizes that renewal within the divided churches is a key to ecumenical progress. And with deep Catholic convictions, she does not hesitate to give her views concerning areas in which renewal must be explored in the Catholic Church. Through the gentle force of her personality and in the clear grace of a vocation, Margaret O'Gara illumined what ecumenism must mean as an imperative shaping the church and expanding the horizons of Catholic faith. In a world where meetings can be onerous, documents dry, and exchanges paper thin, she will ever be remembered as a bright spirit, bringing warmth and clarity to everything she touched. A "certain kind of authority" commended by the Commission on Faith and Order shone in Margaret O'Gara's teaching, writing, and engagement in ecumenical dialogue. And it shines through the pages of No Turning Back. With personal gentleness and profound conviction, Margaret demonstrated ecumenical imagination in searching for new insights on lingering issues of division. She was persistent in the quest for ways to reflect more deeply the unity that we have been granted in Christ through baptism. She recognized that the unity of the church is not ours to create. It is a gift. We are in the presence of an ecumenical theologian par excellence, a veteran dialogue partner, and a brilliant educator: insistently hermeneutical, yet keeping the whole in view, finding the secret Scripture in ancient formula, dissenting voice, and dangerous memory. No Turning Back introduces readers to the spirit of ecumenism-Margaret O'Gara's spirit-which shines through even the more technical essays here. It is a spirit of warm friendship across lines of historical suspicion, creative persistence in search of fresh understandings, and even (dare I say it?) fun! A passionately committed ecumenist, the theologian and teacher Margaret O'Gara was taken from us prematurely by cancer in 2012. O'Gara was an active participant in official dialogues among the Roman Catholic Church and Anglicans, Evangelicals, Lutherans, Mennonites, and others, both in North America and abroad, over several decades, and her ecumenical credentials run long and deep. Her husband, Michael Vertin, collects here a number of her essays as a sequel to her 1998 book, The Ecumenical Gift Exchange. O'Gara herself chose the title, No Turning Back, to express the irreversible commitment to church unity of those who follow Jesus today. Margaret O'Gara introduces the reader to the practice of ecumenical dialogue, a practice that she readily qualifies as a form of asceticism rooted in common prayer, attentive listening, and rigorous theological study. With a clear vision and penetrating insight, she surveys the often-neglected achievements and complex challenges facing the next generation of ecumenical scholars. Margaret O'Gara's crystal clear prose takes us through many important ecumenical achievements of the last thirty-five years, illuminating significant agreements in convergence texts by pointing to the heart of the agreement and then clarifying the steps in reasoning that led to it. In every essay, she found the very small space out of which to forge the next step. During the eight years I was privileged to be Margaret O'Gara's colleague in Canada, I experienced her deep passion for Christian unity and her relentless pursuit of it through theological research, ecumenical dialogue, and (not least) humble prayer. I am convinced that readers of No Turning Back will experience something of what I did.